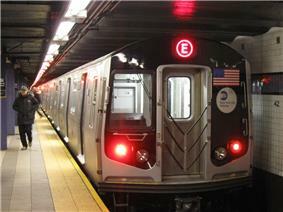 The New York City Subway is the world's largest rapid transit system by track length and by number of stations, at 468. 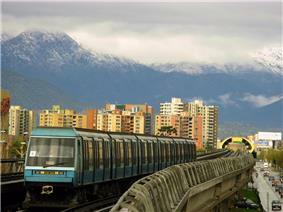 Rapid transit is a type of high-capacity public transport generally found in urban areas. Unlike buses, trams or light rail, rapid transit systems are electric railways that operate on an exclusive right-of-way, which cannot be accessed by pedestrians or other vehicles of any sort, and which is often grade separated in tunnels or on elevated railways. 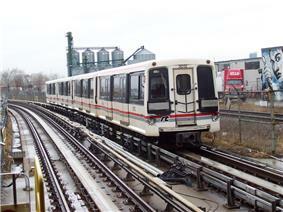 Modern services on rapid transit systems are provided on designated lines between stations typically using electric multiple units on rail tracks, although some systems use guided rubber tyres, magnetic levitation, or monorail. 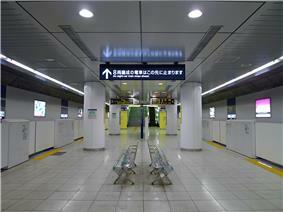 The stations typically have high platforms, without steps inside the trains, requiring custom-made trains in order to avoid gaps. They are typically integrated with other public transport and often operated by the same public transport authorities, but does not exclude a fully segregated light rail transit. It is unchallenged in its ability to transport large numbers of people quickly over short distances with little use of land. Variations of rapid transit include people movers, small-scale light metro, and the commuter rail hybrid S-Bahn. The world's largest rapid transit system by both length of track (842 miles (1,355 km), including  and number of stations (468 stations in total) is the New York City Subway. 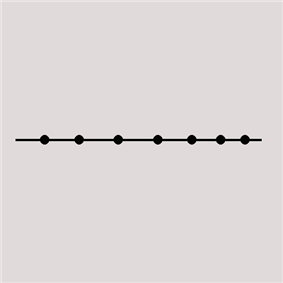 By length of passenger route, the world's longest single-operator rapid transit system is the Shanghai Metro. 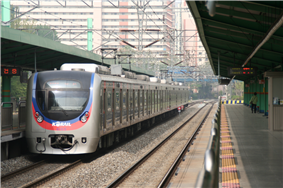 The busiest rapid transit systems in the world by annual ridership are the Tokyo subway system, the Seoul Metropolitan Subway, the Moscow Metro, the Beijing Metro, and the Shanghai Metro. In most of Britain, a subway is a pedestrian underpass; the terms Underground and Tube are used for the London Underground, and the Tyne and Wear Metro, mostly overground, is known as the Metro. 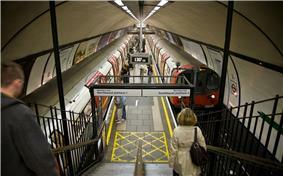 In Scotland, however, the Glasgow Subway underground rapid transit system is known as the Subway. Conversely, in the U.S., underground mass transit systems are primarily known as subways, and the term metro is short for metropolitan area. The opening in 1863 of the steam-hauled London's Metropolitan Railway marked the beginning of rapid transit. Initial experiences with steam engines, despite ventilation, were unpleasant. Experiments with pneumatic railways failed in their extended adoption by cities. Electric traction was more efficient, faster and cleaner than steam and the natural choice for trains running in tunnels and proved superior for elevated services. In 1890 the City & South London Railway was the first electric traction rapid transit railway, which was also fully underground. 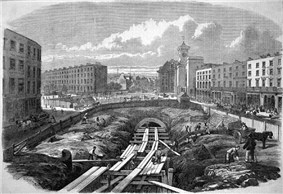 Both railways were eventually merged into London Underground. The 1893 Liverpool Overhead Railway was designed to be electric traction from the outset. The technology quickly spread to other cities in Europe and the United States with some railways being converted from steam and others being designed to be electric from the outset. Budapest in Hungary and Glasgow, Chicago and New York all converted or purpose designed and built electric rail services. There were 19 systems by 1940, and 66 by 1984. 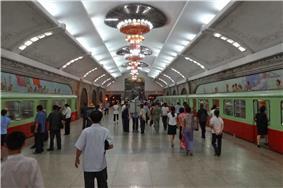 Cities such as Oslo and Marseille opened extensive systems in the 1960s and many new systems were introduced in Southeast Asia and Latin America. Advancements in technology have allowed new automated services. Hybrid solutions have also evolved, such as tram-train and premetro, which incorporate some of the features of rapid transit systems. In response to cost, engineering considerations and topological challenges some cities have opted to construct trams systems. 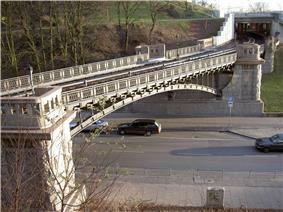 Rapid transit systems may be supplemented by other systems such as buses, trams, or commuter rail. This combination of transit modes serves to offset certain limitations of rapid transit such as limited stops and long walking distances between outside access points. Bus or tram feeder systems transport people to rapid transit stops. In Toronto, over 50% of its rapid transit stations have bus and streetcar terminals within the fare-paid zone, providing a connection without requiring proof of payment. 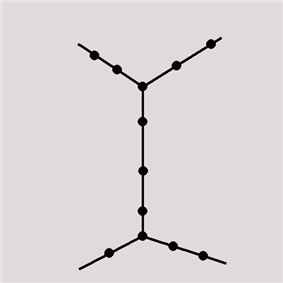 Rapid transit topologies are determined by a large number of factors, including geographical barriers, existing or expected travel patterns, construction costs, politics, and historical constraints. 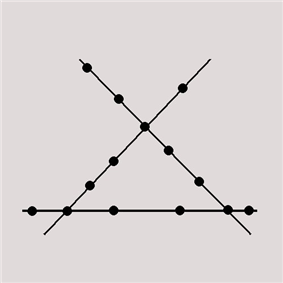 A transit system is expected to cover an area with a set of lines, which consist of shapes summarized as "I", "U", "S", and "O" shapes or loops. Geographical barriers may cause chokepoints where transit lines must converge (for example, to cross a body of water), which are potential congestion sites but also offer an opportunity for transfers between lines. In Walker's analysis, loops appear to provide good coverage, but are inefficient for everyday commuting use, while a rough grid pattern offers a wide variety of routes, while still maintaining reasonable speed and frequency of service. Rapid transit operators have often built up strong brands. The use of a single letter as a station sign has become widespread, with systems identified by the letters L, M, S, T and U, among others. In the Singapore MRT, each station was assigned a unique alphanumeric symbol. E.g. 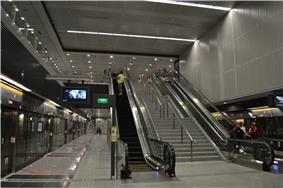 : EW26 Lakeside (26th station on the East West Line). Interchange stations will then have at least two codes. 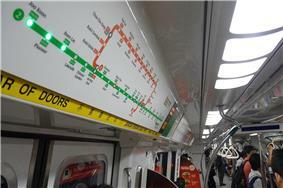 For example, HarbourFront will have two codes, NE1, 1st station on the North East Line section and CC29, 29th station on the Circle Line section. (NE1/CC29 HarbourFront) Branding has focused on easy recognition—to allow quick identification even in the vast array of signage found in large cities—combined with the desire to communicate speed, safety, and authority. 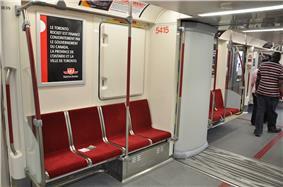 Transit maps can be found in transit vehicles, on platforms, elsewhere in stations, and in printed timetables. 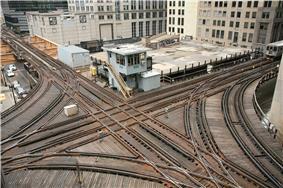 Maps help users understand the interconnections among parts of the system; for example, they show the interchange stations where passengers can transfer between lines. 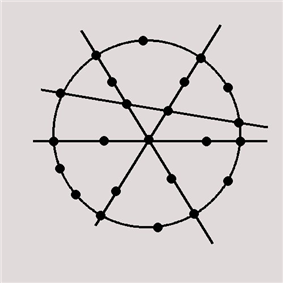 Unlike conventional maps, transit maps are usually not geographically accurate, but emphasize the topological connections among the different stations. 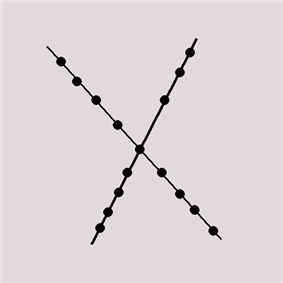 The graphic presentation may use straight lines and fixed angles, and often a fixed minimum distance between stations, to simplify the display of the transit network. 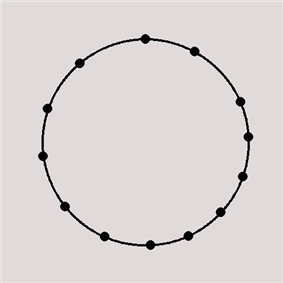 Often this has the effect of compressing the distance between stations in the outer area of the system, and expanding distances between those close to the center. Rapid transit facilities are public spaces and may suffer from security problems: petty crimes, such as pickpocketing and baggage theft, and more serious violent crimes. 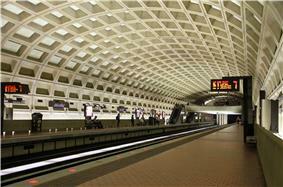 Security measures include video surveillance, security guards, and conductors. In some countries a transit police may be established. These security measures are normally integrated with measures to protect revenue by checking that passengers are not travelling without paying. Rapid transit systems have been subject to terrorism with many casualties, such as the 1995 Tokyo subway sarin gas attack and the 2005 "7/7" terrorist bombings on the London Underground. Stratford Station in London is shared by London Underground trains (left) and Greater Anglia rail services (right), as well as the Docklands Light Railway (not shown). Some cities have opted for a hybrid solution, with two tiers of rapid transit: an urban system (such as the Paris Métro, Berlin U-Bahn, London Underground) and a suburban system with lower frequency (such as their counterparts RER, S-Bahn, future Crossrail, respectively). The suburban systems run on their own tracks with high frequency, but are often quite similar to commuter rail, and are often operated by the national railways. 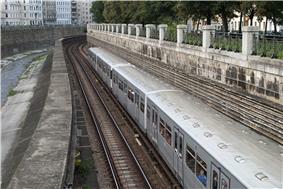 In some cities the national railway runs through tunnels in the city centre; sometimes commuter trains have direct transfer to the rapid transit system, on the same or adjoining platforms. California's BART system functions as a hybrid of the two: in the suburbs, it functions like a commuter rail, with longer trains, longer intervals, and longer distance between stations; in downtown San Francisco, many lines join and intervals drop to normal subway levels, and stations become closer together. Also, some other urban or "near urban" rapid transit systems (Guangfo Metro, East Rail Line in Hong Kong, Seoul Subway Line 1, etc.) serves the bi- and multi-nucleus agglomerations. 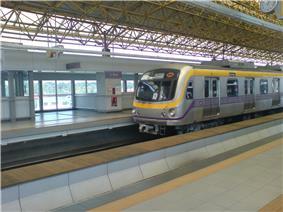 As of May 2012, 184 cities have built rapid transit systems. The capital cost is high, as is the risk of cost overrun and benefit shortfall; public financing is normally required. Rapid transit is sometimes seen as an alternative to an extensive road transport system with many motorways; the rapid transit system allows higher capacity with less land use, less environmental impact, and a lower cost. Banister, David and Berechman, Joseph (2000). Transport Investment and Economic Development. Routledge. Cervero, Robert (1998). The Transit Metropolis. Island Press. European Conference of Ministers of Transport (2003). Safe & Sustainable Transport. Paris: OECD Publishing. Fjellstrom, K.; Wright, L. (2002). "Mass Transit Options". Sustainable Transport: A Sourcebook for Policy-Makers in Developing Cities. Kjenstad, Rune (1994). På skinner i Bymarka (in Norwegian). Oslo: Baneforlaget. Needle, Jerome A.; Transportation Security Board and Cobb, Renée M. (1997). Improving Transit Security. Transportation Security Board. Ström, Marianne (1998). Metro Art. ACR Edition. White, Peter (2002). Public Transport: Its Planning, Management, and Operation. Taylor & Francis. Executive ed. : Joseph P. Pickert... (2000). The American Heritage Dictionary of the English Language, Fourth Edition. Houghton Mifflin Company. 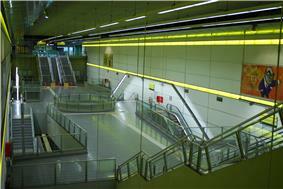 ^ UITP (2011). "Recommended basic reference for developing a minimum set of standards for voluntary use in the field of urban rail, according to mandate M/486". Retrieved 2014-02-16. ^ a b "Glossary of Transit Terminology". ^ Transport for London. London Underground: History. ^ "Facts & Figures - Subways". www.nycsubway.org. Retrieved 2014-09-21. ^ "Facts - Subway and Bus Ridership". 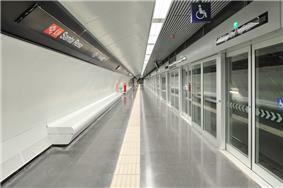 ^ "Shanghai now the world's longest metro". ^ Smith, Stephen J. 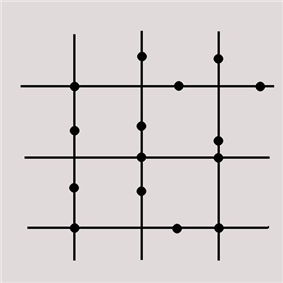 (6 January 2014). "New Starts: Shanghai Metro World’s Longest, Panama Canal Drama, Japan’s Maglev". Next City. Retrieved 2014-09-21. ^ Executive ed. : Joseph P. Pickert... (2000). The American Heritage Dictionary of the English Language, Fourth Edition. Houghton Mifflin Company. ^ """Definition of "Underground. Chambers Reference Online. Retrieved 2006-11-28. ^ Bolger, Paul (2004-11-22). "Site Name: Liverpool Overhead Railway & Dingle Station". Subterranea Britannica. Retrieved 2007-09-19. ^ "Subway". Encyclopædia Britannica online. Retrieved 2006-12-02. ^ a b Pulling, Niel (2008-05-22). 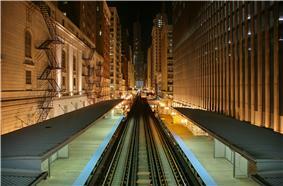 "Light Rail – the Solution to Inner-City Chaos?". Railway Technology. Retrieved 2008-08-18. ^ Walker, Jarret (2012). Human transit : how clearer thinking about public transit can enrich our communities and our lives. Washington: Island Press. ^ "臺北市政府捷運工程局 ─ 營運模式>Q15：何謂L型路網，對旅客有何好處？". Dorts.gov.tw. 2014-04-09. Retrieved 2014-05-18. ^ Office of Hazardous Materials Safety. "A Comparison of Risk: Accidental Deaths – United States – 1999–2003". U.S. Department of Transportation. Archived from the original on 7 September 2007. Retrieved 2007-09-10. ^ "Office of Rail Regulation". UK. Health & Safety Executive. Retrieved 2007-09-10. ^ "El auto de procesamiento por el 11-M". El Mundo (in Spanish). Retrieved 2008-09-08. ^ Sato, Yoshihiko; Matsumoto, Akira and Knothe, Klaus (2002). "Review on rail corrugation studies". ^ Société de transport de Montréal. The Montreal Métro, a source of pride (PDF). p. 6. ^ Railway Technology. "Toulouse Metro, France". Retrieved 2008-08-20. 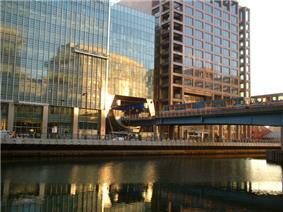 ^ "Docklands Light Railway – About DLR". Archived from the original on 27 October 2006. Retrieved 2006-12-04. 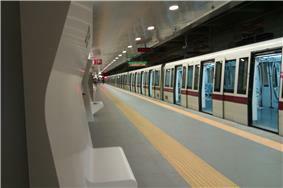 ^ "Bangkok Mass Transit System Company Limited – BTS SkyTrain". Archived from the original on 2006-11-19. Retrieved 2006-12-04. ^ Boorse, Jack W. (1999). "Dual-Mode Traction Power Distribution for Light Rail Transit: A Design Option". Transportation Research Record 1677: 67–72. ^ Ming-Tsun Ke, Tsung-Che Cheng and Wen-Por Wang (2002). 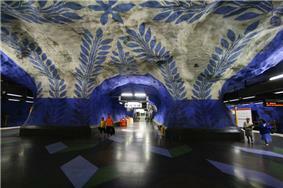 "Numerical simulation for optimizing the design of subway environmental control system". Building and Environment 37 (11): 1139–1152. 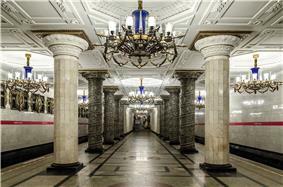 ^ "Metro Arts and Architecture". Metro Bits. Retrieved 2006-12-04. ^ "10 Ways to Enhance Your Community: Unleash the Power of Public Transportation" (PDF). Archived from the original on 17 October 2006. Retrieved 2006-12-04. ^ "World Metro Database". Metro Bits. Retrieved 2013-11-17. ^ Prud'homme, Rémy. 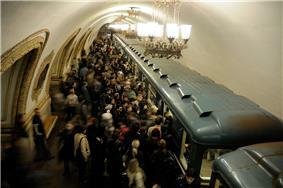 "Public transport congestion costs: The case of the Paris subway". Transport Policy (Elsevier). Retrieved 2012-04-01. ^ "Taipei Rapid-Transit Corporation '08 Annual Report". Taipei Rapid-Transit Corporation. p. 96. Retrieved 2010-07-06. ^ "Delhi Metro gets UN certificate for preventing carbon emission". The Times of India. 2009-02-22. Retrieved 2009-09-10. ^ a b "Delhi Metro gets OHSAS 18001". DMRC. Archived from the original on 2008-06-07. Retrieved 2009-09-10. ^ "Delhi Metro Receives ISO 14001 For Eco-friendly Systems". Press Release. ^ "Delhi Metro is first rail project to earn carbon credits". The Economic Times. 2008-01-05. Retrieved 2010-02-02. ^ Neha Sinha (2009-12-20). "Delhi Metro on track to earn carbon credits". The Indian Express. Retrieved 2010-02-02. 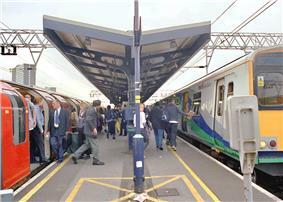 ^ "Metro mulls solar panels at stations to go green". 5 June 2012. Inside a tunnel on the Turin Metro in Italy. 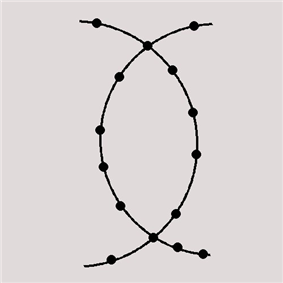 The interlocking tunnel lining segments placed by a tunnel boring machine can be clearly seen. 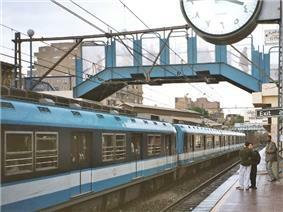 Mar Girgis Station on Cairo Metro Line 1 in 2002. 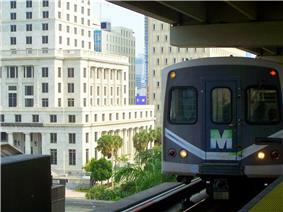 The Cairo Metro was the first rapid transit system in Africa, and the only one until the inauguration of the Algiers Metro in 2011. Lines 1 and 3 of the Cairo Metro are comparatively rare among rapid transit systems in that they use overhead lines (visible in photograph) rather than a third rail for electrification.